In the closing part of Metal Gear Solid 2, one character reveals to another the true nature of an evil plan called The S3 Project. Although it’s explained in a huge amount of detail in the game (taking about 20 minutes of screen time) in summary, it’s an automated system of editing the digital media created by society. The idea being that unless robots choose what's important and erase the rest, what’s truly ground breaking will get lost in a sea of celebrity gossip, pointless blogs about boxed video games and photos of cats on Facebook. It's a complex idea certainly, but there is a degree of truth in it. Digital self publishing means more and more people are able to get their ideas out into the world. This is good in that it gives a greater cross section of opinion but it also makes it harder for anyone trying to find a specific thing on Google. The more that's put out on the Internet the more there is to wade through. I'm very aware that as I'm writing these very words I’m contributing to the problem. In each blog post I make I try to write something fresh and original on a game or topic. I'm very aware that there are many writers out there who know much more about a topic and have a more elegant writing style. If what I'm writing doesn't contribute to what's already out there is there much point in me publishing it? What I bring to the table needs to be more than just a quick history or description of a game as that's been done before. It needs to offer a new insight or a new approach to the subject matter. This all sounds massively pretentious; I'm not even that good a blogger or that original a thinker. But it does explain why it's taken months for me to write about what was before Ni No Kuni my favourite JRPG. It's not through a lack of trying; in fact I've started this post several times and abandoned it. I found it intimidating trying to write words about Chrono Trigger when so many others had written about every facet of the game. A detailed description if the games mechanics has been covered. Astudy of its legacy and influence, done. Even interesting detailed studies of the sublime soundtrack exist. For a game that's so loved and so well known all I can hope is that my view on it encourages others to question or reaffirm theirs. I know that it's almost sacrilegious to say that my favourite ever Japanese Role Playing game, Ni No Kuni is a better JRPG. 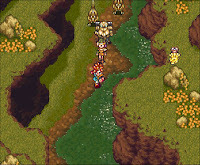 Chrono Trigger is universally adored and well received commercially and critically. 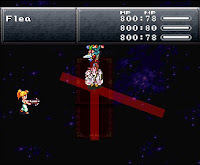 Before I mention the teeny tiny weaker aspects of Chrono Trigger (and cause a mass exodus of readers from my blog) please do keep in mind that I love the game. It's wonderful and I've taken to playing it almost yearly just because I enjoy it so much. I have an orchestral version of the soundtrack on my iPod, used Robo as an avatar on forums for a while and get excited teary eyes when I see people recreate the introduction in glorious HD. Yes Chrono Trigger is superb, but no it's not perfect. 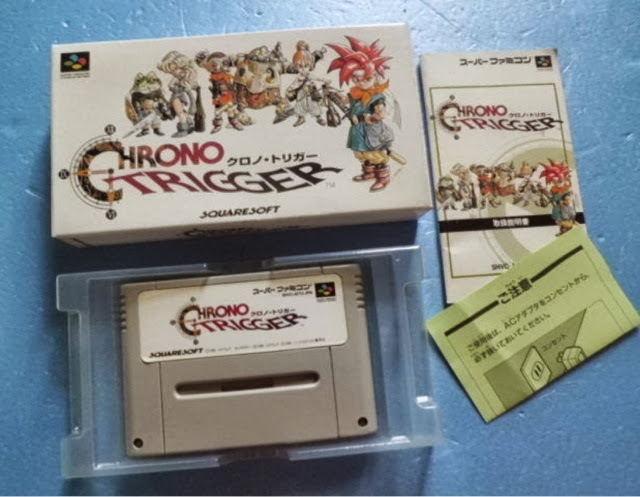 Like everyone in Europe that had a Snes and a taste for RPGs I knew about Chrono Trigger but had never played it till recently. A lack of European release made that impossible. My first dabbles with it was on an emulated PSOne copy and then later when the DS release made it finally possible to buy the game new in a British shop. I first played it therefore a long time after it was made, approaching it after playing the games it inspired first. Returning to a sprite based JRPG after playing polygon adventures was a little like a visual home coming. The 16bit aesthetic may typify the nineties but that doesn't make it look bad or dated. I have often written of my love of pixel art and Chrono Trigger is yet another example of a time when dotty characters looked their best. A rich detailed world demands a rich detailed central protagonist, but sadly this is the first instance where the game (for me!) falls short. Even after numerous playthroughs and after unlocking many of the games endings I have no idea who Crono actually is. It may be a trait of modern games, but considering you’re expected to invest at least 30 hours playing with him there is just not enough back story to the main titular character. This isn't true of everyone in the game of course. 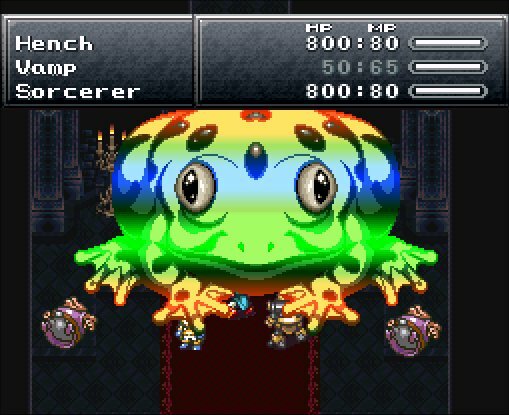 Frog/Glenn, Marle, Lucca and Magus are all fleshed out, it's just the fella you spent most of your time with who isn't. He never speaks, and now seems painfully generic in his design. I appreciate that there is a blank canvas logic to keeping the details of the main character vague, so the player injects themselves into the avatar. The same thing is done in early Zelda games, when you knew next to nothing about Link. However I prefer to be told a story, rather than have to fill in the blanks myself, much like in the modern Zelda games when you know almost too much about Link. you'd miss out on many of the best narrative points if you skip past them. I've played through the game from start to finish now many times yet still find bits that surprise me. On the latest adventure for example I discovered that it’s possible to save Lucca's Mum from an accident that costs her legs- something I'd either missed or failed at before. Yes, this has no bearing on Crono and his world saving fight against Lavos but this tiny plot detail was more moving, showing the care put into the game by creators so storied that they were labelled the 'dream team'. Unfortunately with the game being so open ended in the final section, direction and goals also quickly become vague. Hours can be lost figuring out what to do, with the player adrift aimlessly wondering through both space and time. Many may like the thrill of exploration but it made me feel confused and slightly bored. I've become used to games forcing me down a narrative tunnel or having world maps with waypoints and progression markers. There's a temptation just to give up and head in the one direction that is clear - taking on Lavos and ending the game. Doing so too prematurely though is suicide. The player then has a choice; a huge amount of grinding in the games last hours or gaining the powerful equipment procured in the aforementioned directionless side quests. I generally don't have a problem with grinding, I actually find it quite rewarding. The process of levelling up in Chrono Trigger is actually quite natural and invisible. I never really felt too over or under powered in a normal play through. Story aside, balance of grinding against progression and battle system are what decide if I stick with a JRPG. Random encounters and being forced to fight difficult foes before your ready are big turn offs for me. 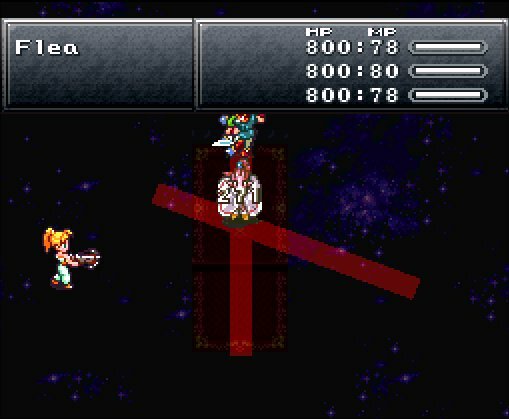 This is why I've never got too far in early Final Fantasy games; I should only fail through poor decision making not because the games unavoidably thrust a duel on me before I've had a chance to heal or gain enough XP. Pleasingly Chrono Trigger dodges these pitfalls with aplomb. With few exceptions you know who will attack you before they do. It’s a 'If you don't like what you see, run away before it sees you' logic. It's a great system that also is used in Ni No Kuni, although in this modern game it's taken a step further as weak enemies will also flee from you. 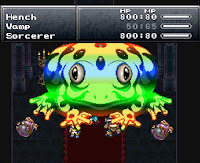 If you choose to fight, there's a huge variety of attacks in Chrono Trigger, with a great flexibility offered by the partnering and tech systems. But this can at times feel intimidating, meaning that if you're at all like me you'll stick to the same tried and tested methods. Running away and being predictable, in my adventure these are the two characteristics of a mute time travelling hero. Much is made of the 12 endings, but to be honest this is a bit of a lie. 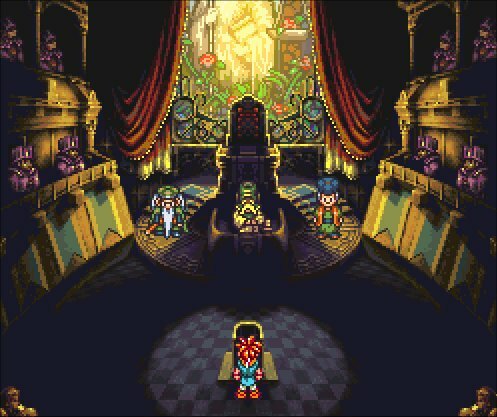 Chrono Trigger had essentially one main ending with four significant variations depending on if you kill Magus and if you used the Epoch to battle Lavos or approached it a different way. The majority of the other endings have no bearing on the story whatsoever and are often silly, ruining the mood of the game and not justifying the effort required to get them. Yes, yes at least these are better than Ni No Kuni’s pathetic two minute denouement but considering many people cite the multiple endings of Chrono Trigger as such a strength its disappointing. Unless you’re a completionist, you would have felt short changed spending 10 hours playing on New Game + to simply see characters after a sprite swap, or a jokey scene involving cats. game. 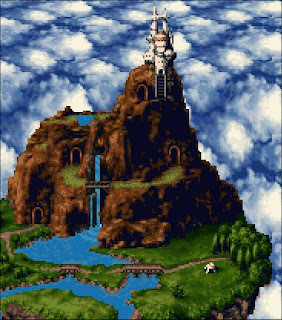 The fact that it’s taken 20 years from the creation of Chrono Trigger for it to be bettered by The Ghibli opus is testament to how forward thinking and simply magical it was. A genre redefining Grade A classic, that no self respecting SNES hoarder should be without. It may be hilariously expensive to buy, even unboxed, on eBay, but the amount of hours I've sunk into it over the years (and no doubt will every year till I lose the ability to see) justifies that cost ten-fold. It may now be my second favourite JRPG of all time but it will always fondly cherished. The fact that this view is echoed by the Internet may mean my words on the game are trite and predictable, but it also means they are not revolutionary. 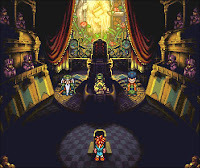 Confirmation therefore that Chrono Trigger is a masterpiece. Just one that's not as good as Ni No Kuni. sold to me by a great seller on eBay. Having played through the game so many times I thought I'd be able to play from start to finish without being able to read the text - I was wrong. About 3 or 4 hours in I abandoned my play through and reverted back to my well worn DS copy. With a set of level 99 characters and all the best weapons a 'new game+' doesn't take too long. All enemies pose no challenge and as such I could focus on the story to a greater extent. I can't say I enjoyed it as much without any risk of failing, with certain bits just feeling like I was going through the motions. But even this play through was much more enjoyable than the majority of games I've played recently. I always forget just how good the soundtrack is and listened to it while not paying. I can finally tick 'listen to Gato's theme while on the tube" off my bucket list. To be honest, I've not played many Final Fantasy games. I also think my love of Ghibli films may have influenced my love of Ni No Kuni. If Chrono Trigger hand more Welsh Stand Up comedy in it, maybe the order of appreciation would be switch between the two! Thank for reading! Never liked this game its boring and makes no sense. You must be the only person in the entire world with this opinion my friend!